At age 29, Barry Fitzpatrick arrived in Tehran to teach English and coach sports in an international school. He instantly fell in love with the richness of the history and art, the kindness of the people, and the kabobs. Soon, however, ominous signs hung from buildings and black-clothed soldiers patroled the streets. 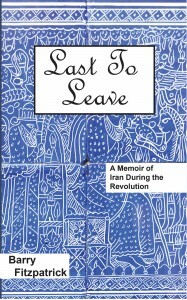 Undetered, Fitzpatrick stayed for four years, married a Persian woman, had a daughter, and continued to absorb the culture until he was at last expelled from the country, two years after the Revolution. Barry Fitzpatrick, B.S., M. Ed., is a career educator with elementary, secondary and collegiate levels experience within both the public and private sectors. He has taught in Europe, the Middle East, and the United States. “Fitz” is presently serving as an Education Consultant and resides in his home state of Maine.